We are a Pet Friendly. No fee. Pet must not be left in room unattended. 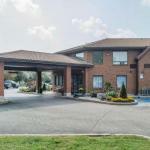 Ideally situated just off Highway 401 and surrounded by attractions, this hotel in Cambridge, Ontario offers a variety of convenient amenities nestled in a peaceful, park-like setting. All guest rooms feature a 32-inch flat-screen TV, free Wi-Fi and a coffee maker. A refrigerator and a microwave are offered in all rooms. Comfort Inn Cambridge offers a complimentary hot breakfast that includes eggs, bacon or sausage, waffles, hot and cold cereal and yogourt. Assorted breads, juices, coffee and tea are available. Guests can dine in the breakfast room or the privacy of their own room. Guests will also enjoy free amenities such as 24-hour coffee service and wireless internet access. A variety of activities are available at the hotel including basketball, volleyball, and horseshoes as well as barbecue and picnic areas. This property offers a non-smoking environment. Local attractions near the Cambridge Comfort Inn include the African Lion Safari, the Wings of Paradise Conservatory, and the Southworks Outlet and Antique Mall. A wide range of restaurants and museums are also nearby..
We plan to add more related stuff like: pet friendly hotels in Cambridge-, Ontario dog friendly hotels in Cambridge-, dog parks in Cambridge-, pet stores in Cambridge-, ON, and pet spas in Cambridge-. Keep checking for more!